SAN DIEGO, CA – Beal Racing’s NHRA Midwest Nationals performance marked a significant improvement over their previous race appearances. The team ran a season best elapsed time and contended for a qualifying spot while laying down competitive runs throughout the weekend. After losing a blower belt during the first qualifying session on Friday, the Beal Racing AutoAnything team sat in the 12th position. The second session was their best showing of the season, as they put together a season best ET of 4.257 at 290.07mph. This marked driver Brandon Welch’s career best in both elapsed time and speed numbers. On Saturday, the team ran their final two qualifying passes of the weekend. The car ran another great pass in the third session, clocking a 4.289 at 289.69mph. This left Brandon Welch sitting 17th headed into the final qualifying session. In that session, the Beal Racing AutoAnything funny car was on pace early to vie for the 16th position, but got out of the groove and moved toward the wall. The pass was aborted and Brandon slid to the 18th position- two spots out of Sunday’s field. Despite missing the field, the team showed vast improvement in several key areas. The volunteer pit crew fought through adversity during the turnarounds and were able to put together a competitive machine for all four qualifying passes. The team showed progress in their clutch setup and successfully put power to the ground. In addition, Brandon continued to improve upon his driving in his rookie campaign. His reaction times showed promise and he was able to work on driving the car with laid back headers. Beal Racing is slated to run their next race at the NHRA FallNationals in Dallas, TX on October 13-16. 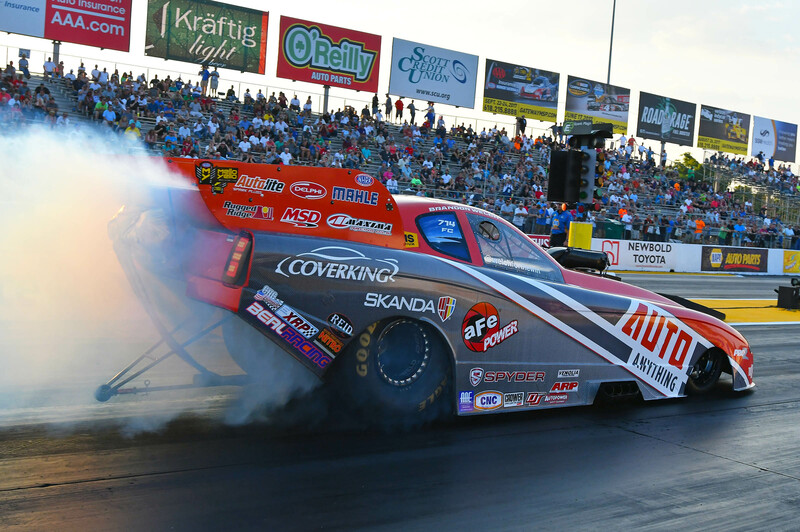 They wrap up the season with NHRA events in Las Vegas, NV and Pomona, CA. San Diego-based Beal Racing campaigns a 300+ mph nitro funny car on the NHRA Mello Yello Drag Racing Series. The team is owned by Chuck Beal and driven by 2016 rookie of the year contender and Chuck’s grandson, Brandon Welch. After 45 years in drag racing, veteran driver Beal handed over the reins of the family race car to grandson, Brandon in 2015. Beal Racing proudly showcases sponsorship from AutoAnything, aFe POWER, Coverking, Spyder Auto, Maxima Racing Oils, MSD, Autolite, and MAHLE Clevite. To learn more about Beal Racing visit www.bealracing.com or tune in to NHRA competition on Fox and Fox Sports 1.